On behalf of the Chinese Embassy in London, I wish to offer my warm congratulations on the launch of the new ICBC London office! This is the fourth time that I have attended the launch of new office buildings of Chinese companies in London since I came here more than two years ago. This is highly encouraging for me because it shows Chinese companies in the UK have made huge progress. It also forecasts a bright future for China-UK financial cooperation. As they get stronger, many Chinese companies are making an all-out effort to go global. For these businesses Britain is highly attractive. The UK is acclaimed as the world’s centre of finance, information and innovation. In addition, Chinese companies are attracted to the sound investment environment that the UK offers to foreign businesses. The latest figures show a clear trend. 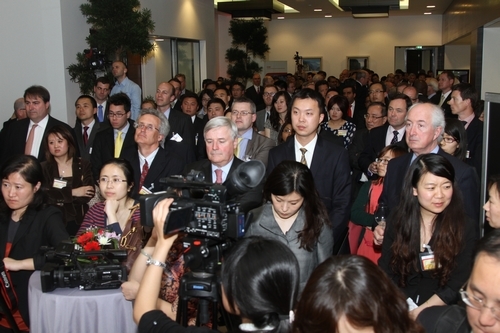 In 2011 Chinese companies invested in 59 projects in Britain, making China the 6th largest investor of the UK. These investments have created more than 1,400 British jobs. The financial sector is a top priority for Chinese companies making investments in the UK. A good example is that China’s ‘big five’ commercial banks (Bank of China, Agricultural Bank of China, ICBC, Construction Bank of China, Bank of Communications) have all opened branches or subsidiaries in London. I hope that more Chinese companies will either open branches or new offices in the UK. The large presence of Chinese companies and their growing investment here speak volumes about their confidence in China-UK economic cooperation. This confidence is underpinned by a strong overall bilateral relationship. This year marks the 40th year of China-UK full diplomatic relations. Over the past 40 years, our economic partnership has gone far beyond trade. It now covers investment, technology cooperation and joint research. We are glad that such booming cooperation has generated huge benefits for both sides. · First, was member of the Standing Committee of the Political Bureau of the Central Committee of the Communist Party of China, Mr. Li Changchun. · And second, was Chinese State Councillor, Madame Liu Yandong. They were here to strengthen cultural links between our peoples. An equally important goal of their visits was to advance China-UK cooperation in trade and investment areas. I am confident that the further restructuring and upgrading of our respective economies will create even greater opportunities for China-UK cooperation. 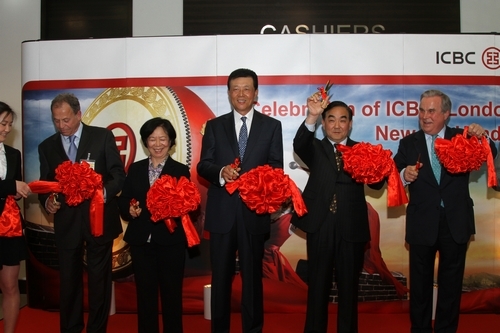 ICBC now ranks as a major global business. 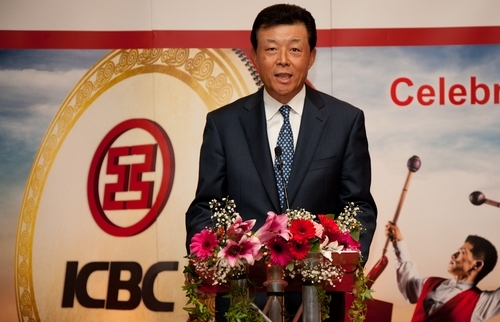 In 1999, for the first time, ICBC became one of the Fortune 500 companies. Since then, it has kept moving up the rankings. Last year, ICBC reached the 77th place. This is the highest position among all Chinese banks. ICBC is also the world’s top bank in terms of market capitalization, profit and the size of deposits. Because of all this, it has an impressive brand value of over 44 billion US dollars. ICBC (London) was opened in 2003. In less than 10 years, it has grown into a highly regarded and international commercial bank in the City of London. This is no mean feat. This office is located in the heart of the City of London. We are surrounded by buildings that remind us of the history and heritage that have created the world’s leading financial centre. As I travelled into the City of London today these traditions made me think of the values of ICBC and its motto, which is: Accomplishment through integrity and progress through actions. In conclusion, I wish ICBC (London) even greater success!